We teach intensive, hands-on glass etching classes that cover all aspects of glass etching and many other other related techniques. These are taught both in our glass school in Santa Fe and in a few key cities around the US or abroad. For information on what seminars are available and what they cover, go to the "Seminars" page. For information on locations and fees, go the the "schedules/pricing page. 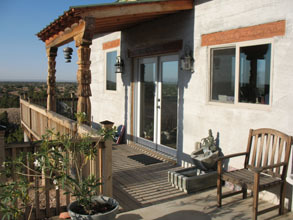 Following is a description of our location in Santa Fe, New Mexico and how to get here. Norm & Ruth Dobbins, owners of Professional Glass Consultants, have been teaching glass etching and other glass techniques for 30 years. These seminars have been held in their own studios and in numerous other locations around the U.S. and in several other countries. Students from all 50 states and over 35 countries have learned glass etching techniques from the Dobbins, and many have gone on to start successful businesses and new careers in glass. You can check the seminars being offered (in New Mexico and elsewhere) by clicking on the Schedules/Pricing button and check on the accomodations by clicking on the Accomodations button. With the current interest in glass etching techniques, these classes have been filling fast. If you see a seminar you like, don't delay - contact us right away to reserve your space. In the future, the school will start adding classes in other glass working techniques like fusing, slumping, wheel engraving, design, and more. Nationally and internationally recognized instructors will be invited to teach. Keep checking this page for more information! No, New Mexico is not a foreign country! Fortunately, we haven't had many of these types of inquiries ourselves. Maybe most people wanting to learn etching are smarter than average (we think so!) or they did better in geography. New Mexico was the 47th state and was admitted to the union in 1912, so if you took geography after 1912, you have no excuse! Even if you do know we are really part of the US, you still may not know how to get here. Or, you may think it would cost an arm and a leg to fly here. Not true! The closest international airport to our studio is in Albuquerque, 50 miles south. Most people flying in for a class find that from almost anywhere in the US. The most reasonable airfares seem to be on US Air or Southwest, but you should always check around. Yes, you can actually fly in to the Santa Fe Municipal Ariport, but check for current available carriers. Rental cars are readily available and you will definitely want one, since we have so many beautiful things to see, from wilderness mountains to Indian pueblos (and casinos) to museums and galleries. We recommend that you try and come a couple of days early or stay a few days after class to explore Santa Fe, the international quality art and the unique local culture. When people come for classes and they don't plan extra time, they usually regret it! The weather is great, and when you sign up for class, we send you a complete package of info about what you need to know and what you need to bring, as well as activities of interest and things to do while you are here.